Leading thinkers from six firms serving the central station channel consider what it takes to get ahead in today’s topsy-turvy marketplace. They tackle solving top challenges, dealing with the DIY and MIY threat, and how to stand out from the crowd. A brutal 2018 that cut across a broad swath of Wall Street didn’t leave publicly-traded electronic security companies unscathed, despite overall industry growth. 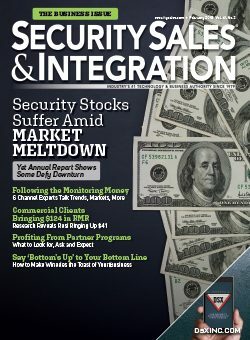 SSI’s annual summary of security industry stocks and financial analysis highlights market drivers, plus a sidebar explains performance in the consumer electronic industry. There are several compelling reasons for security dealers and integrators to sell recurring revenue-based products and services. Among them, according to SSI’s RMR survey, is 23% growth last year and 15% projected for 2019. Security professionals can bank on suppliers to assist them with special discounts, marketing materials, project design and performance, plus much more. Before reaching out, dealers and integrators must research both benefits and drawbacks. Wineries have grown by a third this decade, offering a potentially untapped security opportunity. Find out how to uncork this lucrative niche — no whining allowed!